The Smithsonian Channel launched two weeks ago launched a five week series called BEHIND THE LOST EMPIRES. This week, we screened the latest release called "RAIDERS OF THE JADE EMPIRE." This episode examined the Han dynasty which ruled the East, bringing a lasting identity to the country and people of China. They left behind incredible treasures of jade, sculpture, gold and silk. Unfortunately for modern archieologists, tomb raiders long ago made off with many of the Hans greatest treasures. Three spectacular royal tombs have been uncovered that offered scientists a chance to examine artifacts the raiders left behind or never found  treasures that show the source of the Hans wealth and power and reveal their ideas on life and death. 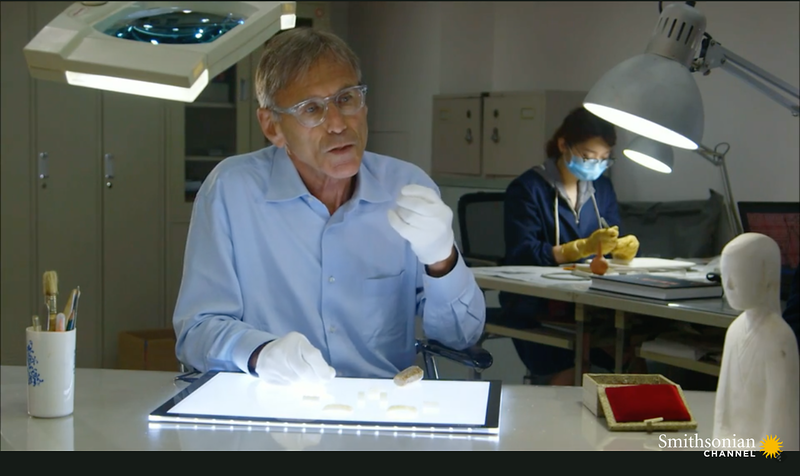 With this exclusive access to a rare opening of a Han dynasty tomb in Xuzhou in northeast China, this episode reveals the secrets of the dynasty that made the nation. Among the extraordinary finds is a jade mummy made up of over 4,000 pieces of the precious stone. By the way we got queazy when Dr Jeffrey Riegal mentioned "they used Jade to plug the orifices in the deceased." Check it out on the Smithsonian Channel. Next up CHINAS EMPEROR OF EVIL Premieres Monday, August 29 at 8 p.m. ET/PT on the Smithsonian Channel. What is Your Presentation Management Strategy?